After the Development Squad/Reserve Squad yesterday easily dispatched Old Firm rivals Celtic, we have to look more deeply at the Rangers squad and where it is headed. Whether at SPL or youth level, beating Celtic is a kind of big deal, and for a Rangers side to rather comfortably do it, whatever the weather, bodes well for the potential. There are a number of facets we can analyse of this victory, but in this entry we look at Glenn Middleton whose inspired performance and brace gives Steven Gerrard a welcome headache. 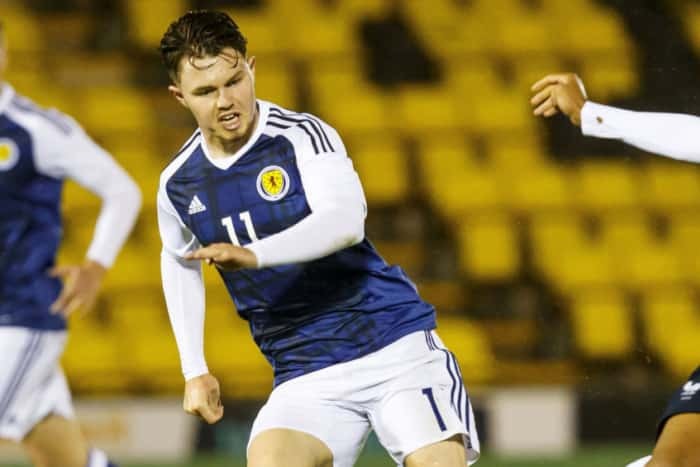 As we talked about in a previous entry, the returning Jamie Murphy has his work cut out on that left side with the likes of potentially Kent and Jordan Jones lining up, but with Glenn Middleton’s continuing good shows for the reserves plus unavoidable knocks on Steven Gerrard’s door, the Scottish youth international is staking a huge claim to be more involved next campaign. Stealing the show against Celtic is a big string to your bow – we all saw how Ryan Kent’s stock went stratospheric when he nailed Celtic at Ibrox, and now another left winger has done the same thing while technically going one better with the two winning goals. Well, Middleton is our player, and at only 19 (makes you feel old, right?) has the world at his feet even more than Kent does. We’ve seen the ex-Norwich youth academy graduate produce it on the big stage, we’ve seen him delivering on his potential in a big way, and while he lost his edge a little (and admitted as such) the possibilities for this lad are endless and we’d have to say we put our faith that Steven Gerrard’s management of him has been to his benefit. We did make a case that perhaps we’d wasted a year developing a Liverpool player for their benefit, when we could have gone with Middleton instead and featured him more, but this way a teenage sensation, producing performances like this against Celtic, is champing at the bit to be involved more significantly next season and will have learned from his mistakes this campaign. And with goals like his second v the green and white lot, it looks like he has. I think you can push young players too fast, too soon. So happy enough for Middleton to get a spell out of the headlines. But I expect him to be at least as good as Kent by the time he reaches that age. He has learned now that you have to be at your peak, every week, to stay in the team. Lesson learned. Would love to see them both in the same team. One of them in the middle, behind the striker, iton the right wing. 5 games left to give Glen a chance to prove himself, again, before Jones and Murphy start fighting for the jersey. He's no ready to deliver, against the big dogs. Big difference between youth level and first team. That's a heap of pressure, you're putting on his young shoulders. looking forward to Glasgow cup final now. karamoko dembele didnt do much did he? we could do with Stephen kellys free-kicks in the first team too. Joe, you may be right but he had more than 20 first team appearances before Christmas, including every one of our Europa League fixtures. He has, I think, same number of goals and more assists than Kent from fewer games. He is not the finished article and he may not be for a while, but I think he is now at the stage where he needs to play bigger games on a regular basis to prove to us and himself if he is ready. If he isn't, he goes back to the unders. Eventually, he will be ready. Derek Johnstone was 3 years younger when he scored in a Cup Final against Celtic. I think Parlane also started at 16. Gerrard himself was playing for Liverpool at 19. England have played a guy who can't get a game for Chelsea who is a teenager. We keep trying him, only way to find out when he is ready. Fair comment, SWH. No harm in seeing if he's up to it. He looks like an Absolute Diamond of a player! ...and I hope in 5years or so, He can make us a few quid. The boy has potential but he`s not at Kents level yet .You can`t compare his two goals against a Celtic side without one experienced player in it , to Kents performances in the last 2 O.F games. Middleton hasn`t shown the same ability to come off the wing and influence games that Kent does , he has a basic beat a man and cross style which is good but we don`t really have anyone in the box to aim at .He started well then fell away badly, now he is pushing again so hopefully he will get some game time probably in front of Grezda .